There are huge celebrations today at the European Space Agency. From @ESA_Rosetta: "I see you too! #CometLanding"
There was jubilant scenes at the European Space Agency this afternoon as its probe landed on a speeding comet successfully. The Philae lander left the orbiter Rosetta and touched down on the comet just after 4pm Irish time. It’s journey after it left its mothership took about seven hours. Scientists, seen below in full celebration, hope the lander which is equipped with 10 instruments will unlock the secrets of comets — primordial clusters of ice and dust that may have helped sow life on Earth. It wasn’t an easy ride. There were some worries about temperature this morning but eventually, the lander got to its final destination. The scientists and researchers at ESA weren’t the only people excited about today’s developments. One William Shatner was following the livestream closely. Our own Chris Hadfield was also crossing his fingers and toes ahead of the landing. This was the first ever landing on a comet, an important moment in the human quest to explore the origins of the Solar System. During the numerous speeches of congratulations today, Jim Green of NASA said that a single-planet species will not survive, in his opinion. “It is these things that will lead us to Mars,” he told the audience. “It’s our destiny to move off this planet and these are the types of things we must do,” he said before thanking ESA for its incredible and “audacious” contribution. And just in case you’re confused about a NASA guy talking at the event – this one was all ESA’s. The Americans have been graciously explaining to their Twitter followers that they can’t take the credit for this one – but they have pointed out that they have three instruments on board. Email “TOUCHDOWN! European probe leaves its mothership and lands on comet for first time ever”. Feedback on “TOUCHDOWN! 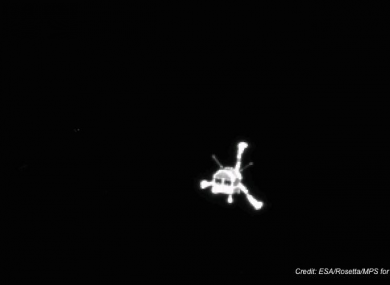 European probe leaves its mothership and lands on comet for first time ever”.